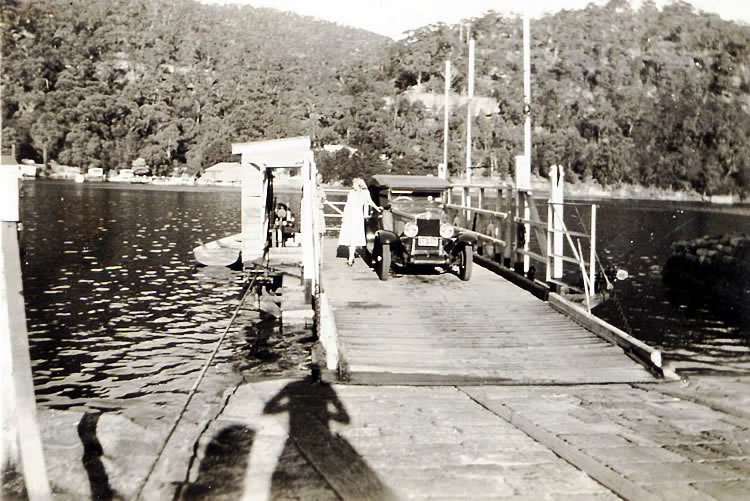 We have had some interesting conversations about this early image of Berowra Waters Ferry! The partially obscured man is in fact the ferry master, Bill Ewings, father of Pat and Jill who donated the picture. We thank long time Berowra resident, Peter Huett for the following information. Peter’s family had the contract for running the ferry in the late thirties. The engine seen at the side of the ferry is a Chapman Pup. If the engine ever broke down the ferry master could bring the ferry to the shore manually. On Sundays, Peter, aged as young as 10, had the job of opening the ferry gates. The car was identified by Peter as perhaps a Rugby or an Essex. A lot of you would have seen the shadow of the photographer in the foreground in the typical pose for using a camera like a Brownie. Had the photographer been the driver of the car? We are still hoping to hear more about the elegant lady posing for the photo.